I wrote a post a while back sharing 12 reasons Why I am Not Migrating From Blogger To Wordpress. I say blessings to those who want to go but I also say that there is absolutely no reason that I can see why someone cannot be just as big a success on the Blogger Platform as long as they abide by Blogger Content Policy and Google Terms of Service. It is free. That doesn't mean that I am unwilling to invest in my blog, it just means that I can use my money in different places rather than spending on platform, hosting, etc. I can use any domain name that I own rather than the blogspot domain. I can have as many as 100 Blogger Blogs for free. That means I can have a practice blog where I can tinker and play with new code, styles, etc before I use it on my actual blog or I can actually have other working blogs. I think 100 would be crazy but I can if I want to. It is Stable. I don't have to worry about plugins making my blog do crazy things and if by chance one does, then it is super easy to remove the offending widget. There are no bandwidth limits on Blogger Blogs. Blogger keeps things running smoothly. I don't have to worry about too many visitors taking it down and/or out. That is Blogger's job which leaves me to do the parts I do like on my blog. There are no limit to the number of posts. Only on images and I can purchase more storage space for those at minimal cost. The Comment system is pretty great. There are a few hiccups (I wish they could somehow keep the old system and still post the comments to Google+ too.) but overall I am very happy with their system. I love their new captcha feature of checking a box to prove it is not a robot. That means so much less spam to go through. Their spam filters are pretty great too. I can have as many stand alone pages as I want aside from my blog posts. These can be assigned to a link or I can design a page. It is safe. I can back up my posts and my template so that if anything happens (oh horror!) then it is easy to get going again within minutes. It has great security. Google, monitors things for me so that if someone from some other place tries to log on without my permission then, I know it. That comes with all my Google accounts. I still own the copyright on all my content uploaded to any Google Services and Google helps protect that right for me. If I follow Blogger's rules then I don't have to worry about them removing my blog. If for some reason they ever decide they don't like me or my content, then I have a backup of all my work so all is not lost. I also keep a backup of all my photos stored on Picasa and Google+ and the documents etc. that I store in cloud storage everywhere. That is just smart business. I have a hard drive storage that I keep everything on. I have even been considering a 2nd hard drive to keep in a safe place other than my home just in case. I have the benefit of all the Google products to enhance my blog such as Feedburner, Google Analytics, Google Drive, Google Photos, etc. The cost for more storage when needed is pretty minimal when I consider how much I store there. Google is always coming up with new things and I benefit when that happens. I can design my Blogger Blog to look any way that I want. It sometimes requires that I do a little research and tinkering with code but it can be done. If they have it over at Wordpress then I can pretty much have it at Blogger too. There are 1000s of places online to learn how to design my Blogger Blog just the way I want for free. There are 1000s of people online who I can hire to design my Blogger Blog to look and act just the way I want it to. There is a way to merge Multiple Blogger Blogs into just one and not lose my content. I did just that. I merged 4 blogs into Texasdaisey Creations. I was even able to forward my traffic as long as needed. It is a great place to make friends. I have discovered that my Blogger Blog friends have staying power and they are some of my best cheerleaders. Every blogger who wants to make it big needs a tribe of cheerleaders and I have found that here. 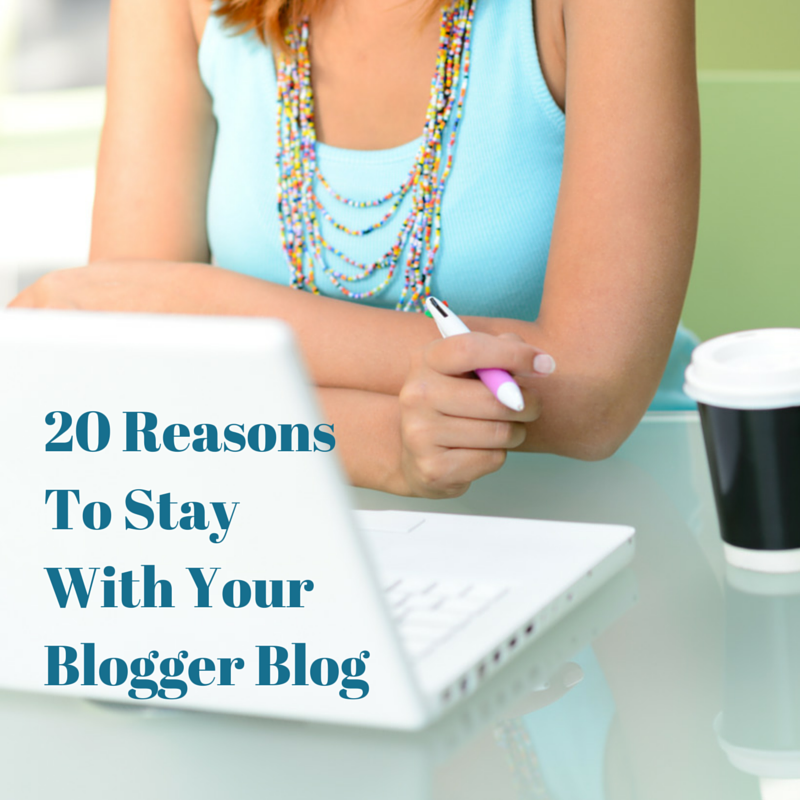 I could go on naming the benefits of staying with a Blogger Blog but, I think I have covered most of the big reasons. I don't hate the other platforms. I follow lots of blogs from those other platforms. I just see how Blogger has so many benefits and I definitely enjoy those benefits. Even if you do decide to move on, that is OK too. It will definitely not keep me from following you or cheering you on. I'm not a Blogger snob just a fan. I love my blogger blog. You have given all good reasons for keeping it. The reason I have stayed, is that wordpress confuses me. I like the blogger look. I say whatever platform you feel most comfortable and works for you... go for it! You are so right Scentsy Katie! We should all be where we feel the most comfortable and hopefully not look down on others who aren't in the same place. I'm pretty pleased with Blogger, aside from the latest comment inconsistencies. Your list is a good one!